A rare mineral sometimes used as a gem material. Variscite nodules: Nodules of variscite with crandallite and wardite from Clay Canyon, Fairfield, Utah. Specimen sizes, clockwise from top left: 7.5 x 5.9 cm; 6.8 x 5.6 cm; 11.1 x 6.6 cm; 17.5 x 13.3 cm. Specimens and photos by Arkenstone / www.iRocks.com. Variscite is a rare hydrated aluminum phosphate mineral with a chemical composition of AlPO4•2H2O. It is usually green in color, ranging from yellowish green to bluish green. It does not have any significant industrial use. Variscite specimens of exceptional color and appearance are often cut into gemstones, used to make small sculptures, or used as an ornamental stone in small projects. Color Typically yellowish green to slightly bluish green, often with yellow, brown or black matrix. Also known to be yellowish brown to brownish yellow. Cleavage Cleavage is rarely visible because variscite usually occurs in microcrystalline aggregates. Diagnostic Properties Color, concretionary habit with matrix, refractive index, spectra, Chelsea filter reaction. Variscite is rarely found in crystals that are large enough to see without magnification. Instead it usually occurs in cryptocrystalline masses, nodules, veins, or cavity fillings. These usually form as a secondary mineral in near-surface deposits where phosphate-bearing waters interact with minerals that contain aluminum. In the United States, variscite is found in Nevada, Utah, and Wyoming. It is also found in Australia, Brazil, Germany, Poland, and Spain. 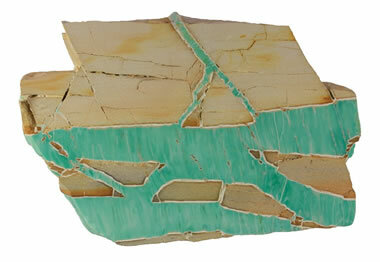 Variscite is often found in the same geographic areas as turquoise, and this can result in variscite being incorrectly identified as turquoise. Variscite fracture fillings: Variscite has filled the fractures in this piece of siltstone. This specimen is from Queensland, Australia, and measures 4.3 inches (11 cm) across. Creative Commons image by Siim Sepp. Variscite doublets: Four cabochons of diverse color and appearance, all cut from variscite backed by an unidentified material. The two cabochons in the bottom row were submitted to the Gemological Institute of America's lab for identification, and they reported the identity as "doublets consisting of a variscite top and an unidentified backing material." All of these cabochons were cut using variscite reported to be from the New Landers area of Nevada. The large brownish yellow cabochon is approximately 29 millimeters in length. Variscite of exceptional color and appearance is often cut into cabochons and sold as a collector stone. These cabochons are also used in jewelry. If you are interested in variscite jewelry, you will probably have a hard time finding it in a jewelry store. Variscite is a rare material, the jewelry-buying public is not familiar with it, and as a result, it is rarely seen in jewelry stores. 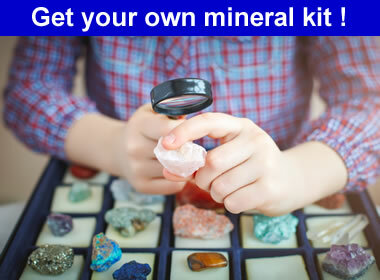 You are more likely to find it at a lapidary show, a rock shop or in a shop that specializes in unusual gems and jewelry. You might be pleasantly surprised by the price. Because there is little demand for variscite it is relatively inexpensive. You will see photos of three variscite cabochons and four variscite doublets on this page, and we paid $70 or less for every one of them. Variscite cabochons typically have an appearance that is very similar to turquoise, but they usually have a more “greenish” color. Variscite cabochons are seen with and without matrix, which is often yellowish to brown, or gray to black in color. 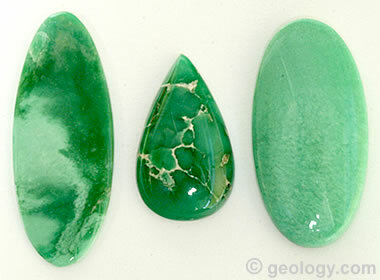 Variscite cabochons are often cut as "doublets." This means that before cutting, the variscite is joined by cement to a thin piece of backing material such as glass, plastic, basalt or obsidian. This improves the stability of the cabochon; however, if the buyer is paying "by the carat," some of the weight will be backing material. 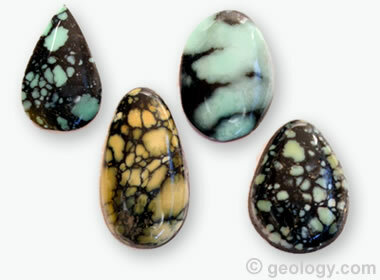 Variscite cabochons: Cabochons of variscite in beautiful shades of green. The two cabochons on the left were cut from variscite mined in Utah. The cabochon on the right was cut from variscite mined in Nevada. It is about 37 millimeters in length. Variscite has a Mohs hardness of only 3.5 to 5, and because of that it is very easily abraded if used in a ring or a bracelet. It is best used as a pendant, in earrings, in pins, or in other items that will not be subjected to impact or abrasion. Variscite can also be scratched or damaged if it is stored or carried in ways that abrasion can occur. Staining can be a problem with variscite in jewelry. Variscite is a porous material that can be discolored by contact with oily skin, cosmetics or other substances. It is best used in designs that minimize skin contact. As a pendant, it can be worn with a piece of clothing between the gem and your body. Cleaning with warm water and a mild soap is recommended. Variscite and turquoise are sometimes found within the same geographic area, and they also can have a similar appearance in the rough or when cut into cabochons. As a result there has been some confusion, with variscite sometimes being identified as the more common and familiar turquoise. Vendors with uncertainty have been known to use the name "variquoise" for rough and cabochons of questionable identity. The minerals have a color range with a slight overlap. 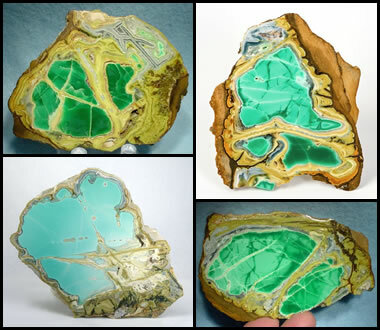 Turquoise ranges from greenish blue to bluish green, while variscite ranges from yellowish green to bluish green. People who are familiar with the minerals might recognize yellowish green specimens as variscite, but might not feel confident about bluish green specimens. Cabochons of the two minerals can usually be separated from one another with standard gemological tests. Refractive Index: Turquoise produces a spot refractive index of about 1.61, while variscite has a spot refractive index of about 1.57. Spectra: With a spectroscope, turquoise sometimes displays weak bands at 420, 432 and 460nm. Variscite sometimes displays a medium band at 690 and a weaker band at 650nm. Chelsea Filter: When viewed through a Chelsea filter, variscite usually has a weak pinkish color. If you have a cabochon that you suspect might be variscite, many gemologists and gemological testing labs offer a gemstone identification service. Geology.com does not offer that service.